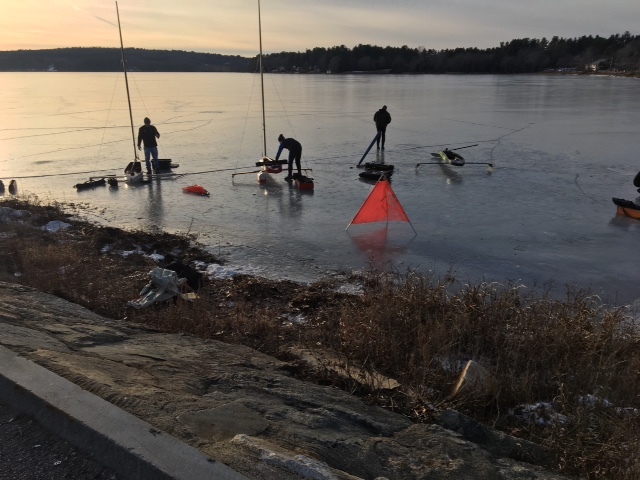 Awesome early Christmas on Quaboag yesterday as eight DN’s (six modern, two vintage) and a batwing spent the day tearing it up on 4″-5″ of grade 9 ice. No hazards found, only a few ice fishermen off to the side. One of them caught a 7 lb largemouth bass- not a bad day for those guys either! The one and only Jeff Kent was out doing recon and coaching the group. Good breeze all day, rigs bent, we must have done ten races. Not bad…. Great sailing, hopefully that plate will survive the holidays. Speaking of the holidays, hope everyone has a great one and will see everyone as soon as possible out on the ice as soon as the festivities are out of the way!